Getting where you're headed takes a lot of steps, especially if you're Rocky. 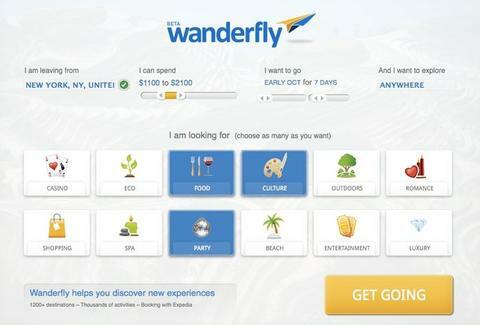 Getting you where you're headed in just a few: Wanderfly. Touting itself as a "Pandora for travel", Wander's eschewed the bare bones layout of other similar sites to create a more user-friendly vacation inspiration-izer, requiring only 4 ultra-quick steps to send back a lushly-detailed set of destinations fitting your interests and budget, so...enjoy the walk to Wendy's? Spend 30 secs selecting your 1) departure city, 2) price range, 3) ideal date/length of trip, and 4) areas of interest (from a dozen options including food, party, casino, and romance), and using their proprietary algorithm Wander'll spit back the top 15 matches in tile format, as carpet format might make getting places tuft. Boasting more than 1200 (and growing) locales, each listing comes bursting with an overview, pics, & rec'd activities that match your interests, all culled from partner sites including LonelyPlanet, Flickr, Yelp, and Foursquare, though attempting to become the mayor of Burma will probably only get you a free caning. Each trip's fully priced out via an Expedia-powered airfare/hotel search designed to get you the most luxe for your buck, and you can book the whole shebang in literally just 3 more steps, far fewer than many airfare sites, but more than Stallone can probably handle these days.